From their union website at http://www.uaosu.org/ Presumably this means they believe they can win a card-check election, and will start soon. Long-time readers may remember that I started out opposed to the UO faculty union, but signed the card once I realized they were going to win, and I’m now the union treasurer. Even the UO administration now agrees -with a few exceptions – that the union has been a good thing for UO. No premier research-intensive university in the U.S.—no true aspirational peer of OSU—has a unionized tenure-track faculty. Recently, both the University of Washington and the University of Minnesota worked to successfully defeat unionization of their faculty, for reasons similar to those listed below. From what I can tell from the emails, the letter came from UO General Counsel Randy Geller, Associate GC Doug Park, Faculty Athletics Representative Tim Gleason, VPAA Barbara Altmann, VPAA Doug Blandy, Consultant Marla Rae, HLGR’s Sharon Rudnick, William F. Gary and Kate Grado, and Michelle Cole of Gallatin Public Affairs – or at least they were in the loop. I don’t know what OSU is doing in this regard. 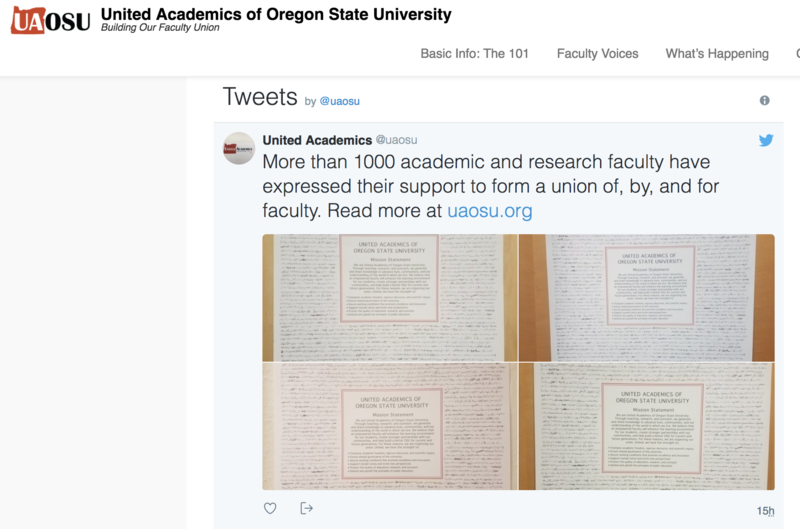 Tagged AAUP-AFT Union?, Faculty Union (United Academics of UO). Bookmark the permalink. The implicit premise here is of course that the terms Administration and University are coextensive; what is *meant* by the term “University” *is* the Administration. Therefore anyone who criticizes the Administration is, by definition, anti-University.